Make sure your chemical storage is properly stored with our 100% compliant chemical storage buildings. U.S. Chemical Storage offers expert advice on all of our products, and we deliver the safest and most trusted chemical storage buildings in the industry. Our storage buildings will provide you with the ultimate protection and security, while delivering 100% compliance. Listed below are our high-quality chemical storage buildings that will provide you with our cutting edge technology and 100% complete compliance. Our CHEMLoc chemical storage buildings are designed to be non-fire rated. CHEMLoc storage buildings will house any chemical storage material that contains a zero (0) for NFPA flammability rating. Extremely strong and durable, the CHEMLoc series chemical storage buildings are designed for harsh weather conditions with our extremely durable chemical-resistant, epoxy top coat. Hazardous materials are stored safely with our 100% customizable buildings. With our design-build manufacturing system, your chemical storage buildings can be customized to your exact specifications. Manage and keep your chemical storage compliant with our CHEMLoc chemical storage buildings. TURFLoc chemical storage buildings are constructed for storing chemicals that are used in turf maintenance and agriculture applications. The customizable non-fire rated chemical storage buildings are modeled for herbicide storage, fungicide storage, pesticide storage, fertilizer storage, and other agriculture chemical storage applications. Hand-welded from heavy-gauge metal steel, right here in the U.S.A., gives our storage buildings the superior strength needed for your chemical storage. Finished with our durable chemical-resistant epoxy top coat, you can be sure that your TURFLoc storage building will be protected internally and externally. Keep your chemical inventory safe and secure with our extremely strong and dependable TURFLoc series storage buildings. 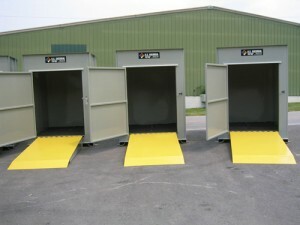 FIRELoc chemical storage buildings are fully customizable and 100% compliant with all NFPA, OSHA, and EPA regulations. Our 2-hour fire rated FIRELoc storage building gives you ultimate protection for your flammable chemical inventory. Our hand-welded, heavy-gauge, metal steel buildings offer the strongest and safest flammable storage buildings on the market today. When storing, mixing or handling Class 1A flammable chemical storage and Class 1B flammable chemical storage our FIRELoc series storage buildings are the perfect choice to manage and keep your flammable storage safe. Keep your facility, investments, and personnel safe with our 100% compliant FIRELoc series storage buildings. Our explosion proof FIRELoc feature, offers ultimate protection when storing combustible, and explosive hazardous materials. We offer our industry leading 15-year structural warranty with all of our chemical storage buildings. Our SUPERLoc storage building is the ultimate choice when storing flammable chemical storage or explosive materials. The SUPERLoc series storage building is 4-hour fire rated, and allows for your chemical storage to be stored inside your facility. Having your chemical storage inside your facility will lead to increased production operations and efficiency within those operations. SUPERLoc features our leak-proof, built-in, secondary containment sump for increased safety measures. Our 100% customizable feature ensures that your chemical storage building meets your unique specifications. We offer high quality building to meet all of your compliance needs. Increase your manufacturing operations while keeping your chemical storage fully compliant with a SUPERLoc chemical storage building.